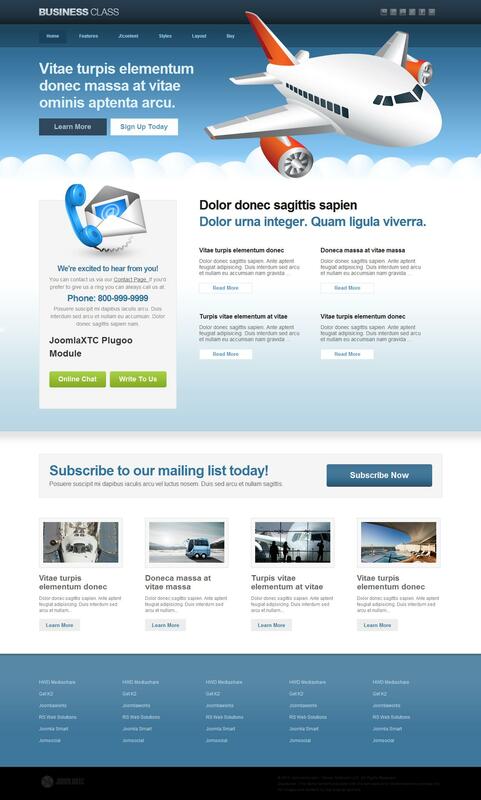 JXTC Business Class - one of the best business templates from the studio JoomlaXTC. Template design is clean and friendly, fast loading differs by SEO optimization code. Style template allows it to be used for business resources on any subject (travel, hosting, etc.). Supplied with the JoomlaXTC XTC Framework, that allows you to have complete control over the template styles, and a correction of the pattern width and columns, backgrounds, color, and font sizes, layouts module positions and much more. Has 6 preset styles, 30 module positions, flexible design, uses CSS3. The set includes the following extensions: eluxe NewsPro Module, Html Pro Module, Plugoo Pro Module and Contact Wall Module.